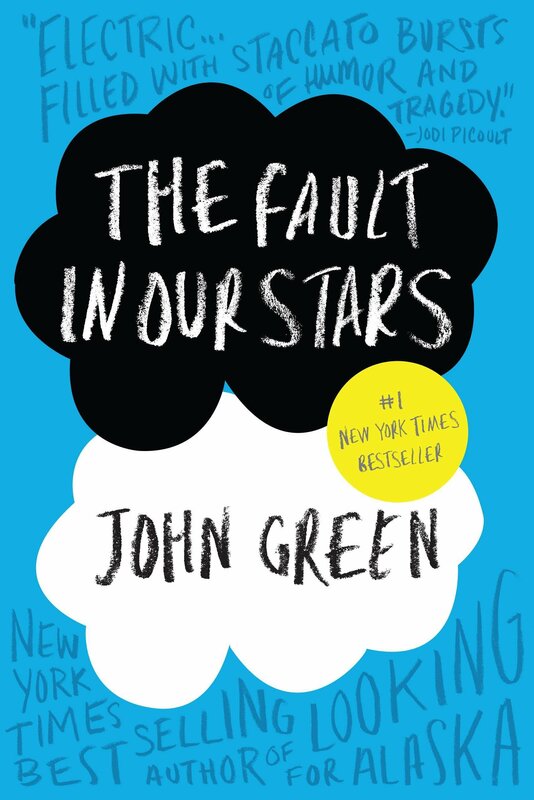 The Fault in Our Stars was first published in 2012, written by John Green. It tells the story of Hazel, a teenage cancer patient who reluctantly attends a support group to make her parents happy. At this group Hazel meets Augustus Waters, a fellow cancer sufferer who has been given the all clear. Love, laughter, heartbreak, a once in lifetime trip to Amsterdam and the disappointment of being let down by somebody they admire awaits the two teenagers and we have the privilege of joining them for the ride. The film adaptation was released in 2014, directed by Josh Boone. The film closely honours the book with the storyline following the same progression as what I have written above. Shailene Woodley portrays Hazel and Ansel Elgort plays Augustus. The film was well received both by audiences and critics and was nominated, and indeed won, many awards. So, what are the main differences that I spotted between the book and the film and which is better? If there are any that I missed then please share them in the comments. There are two characters that appear in the book that do not make an appearance in the film and they are Kaitlyn (Hazel’s friend) and Caroline (Augustus’ former girlfriend). Kaitlyn is not a huge character in the book but she does remind us of the ‘usual teenage dilemmas’ and provides, in my opinion, an important reminder of what Hazel misses out on due to her illness and simply how her life is different to that of her peers. Caroline was a brain tumour sufferer and also the girlfriend of Augustus. We learn, through his memories, of the toll her deterioration had on him and how her demeanour changed as her illness progressed. Again, I feel this was important within the book, it showed the devastating effect that cancer can have on the sufferer and those around them and Caroline was important for so long in Hazel’s journey also. Her worry about being a grenade that would break Augustus’ heart was exacerbated by her thoughts about Caroline. Therefore, I feel like the two characters would have been a great addition to the film and I am rather disappointed that they weren’t included. I appreciate that it is impossible to include an entire book in a film but I feel like there was potential to include them in some capacity. In the book Hazel meets Augustus inside the support group. There is a delay before they engage in any interaction besides him staring at her as they sit in the circle. In the film however, Hazel bumps into Augustus and that is their first interaction. There are immediate sparks, enough that he walks into the door frame just afterwards and she heads to the bathroom to check on her appearance. This change didn’t bother me. I think both are equally effective and to be honest I only included this difference because them meeting is obviously important, I just don’t think how they meet is so important, particularly when the difference is so minor. In both the book and the film Augustus invites Hazel back to his house to watch a film. There are two differences however. In the film there is no specific movie that he wants them to watch together but in the book there is. He is eager for her to watch V for Vendetta because he believes she strongly resembles the main actress: Natalie Portman. In addition to this, in the book Augustus’ parents prevent them going to the basement to watch the film, they are instead made to watch it in the living room. In the film however there is no intervention from his parents and they can make their way to the basement without any comment from his mum and dad. The first of these changes doesn’t bother me, Augustus believing Hazel looked like Natalie Portman held no significance for me and I didn’t feel it was lacking in the film. The second change did annoy me slightly. I feel it is more realistic to have his parents intercept them heading to the basement. These small details are important in my opinion because it reminds us that despite their respective illnesses they are teenagers and they do have to answer to their parents. Isaac as a character appears to be far more important in the book than he is in the film. In the book Hazel visits Isaac in the hospital after his eye surgery but this episode does not take place in the film. Also, Hazel plays video games designed for blind people with Isaac in the book, again this does not take place in the film. It disappointed me that Isaac wasn’t featured as much in the film. He was a very important character in the book for me and I think he deserved to have more screen time than he was afforded. I understand that the main aim of the film was to shed a spotlight upon Hazel and Augustus but I wish that had been achieved without having to eliminate some important Isaac moments. In the book Hazel and her mother go to pick Gus up to head to the airport for their trip to Amsterdam. When they arrive they hear a furious argument taking place between Gus and his mother. We learn later that this is related to his cancer returning and whether he should be going on the trip or not. This is a really poignant moment in the book but it is eliminated in the film adaptation. Instead Gus arrives at Hazel’s house in a limo to take them to the airport. I feel like this change was completely unnecessary and I can’t figure out why it took place. This one infuriated me, I suspect partly because, in my opinion, it was unnecessary to change and partly because foreshadowing is such an important concept and I believe it would have really enriched the film as it did the book. 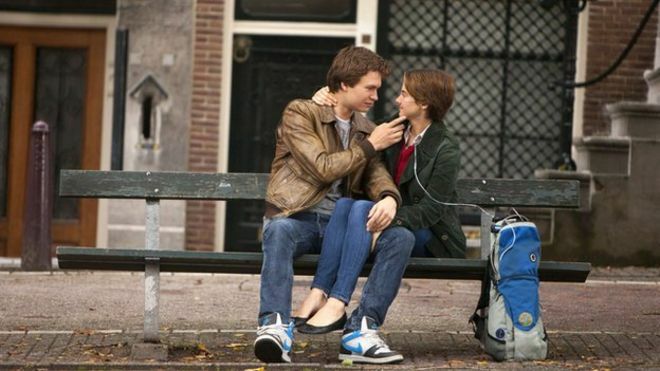 In the book Gus tells Hazel that he loves her when they are on the plane to Amsterdam, in the film however he declares his feelings when they are having their meal at the restaurant. This was another difference that I didn’t mind. In both the film and the book the moment where he tells her that he loves her is beautiful and it didn’t seem to matter where it took place, his words were the important part. When Hazel and Augustus have their date at the restaurant in the book they dine outside, in amongst the day to day life of Amsterdam. The film sees them dine indoors. I much prefer the book portrayal. I think it is more intimate and romantic and just generally more special overall and I wish the film had stuck to this. I can’t deny that I was disappointed when I saw them take their seats inside. Hazel’s swing set is present in both the film and the book and it serves as a symbol for her sorrow in both. In the book Augustus helps her to donate it to spread joy to a new family. This does not happen in the film. Again I wish this hadn’t been changed. It was a lovely moment to see the swing set that was so important to Hazel be gifted to a new family so that her father’s hard work in building it was not in vain. As I said before, I understand that not all parts of the book can be put into the film but this one really touched me and I wish it had made the cut. When Gus finally makes us and Hazel aware that his cancer is back and it is terminal the rate of deterioration differs vastly between book and film. His decline is far more rapid in the film than the book and this leaves certain episodes omitted such as when he wets the bed in front of Hazel. This is a poignant moment in the book, it shows the reality of illness in all it’s embarrassment and desperation. It also highlights the power of love, Hazel is not fazed in the slightest, her love for Augustus overcomes everything. I do feel like the film rushed Augustus’ decline a little too much, perhaps other parts of the film could have been shortened to afford more time to this section because it is pivotal in the story. The book and the film tackle the aftermath of Augustus’ death quite differently. In the book Hazel reads the many condolence messages that are posted online after he passes. She reacts angrily and lashes out, believing Gus would have hated what she views as empty words. This does not take place in the film. In addition Gus’ eulogy for Hazel is tackled differently. In the book Hazel faces a frantic search to track down his words, finally finding success through Lidewij who confirms that Gus sent them to Van Houten and sends them back to Hazel. In the film Van Houten delivers them to Hazel himself at Gus’ funeral. He doesn’t say what the letter is so Hazel screws it up and throws it into the back of her car because she is so angry with Van Houten. It is only later when Isaac explains what the letter is that she returns to her car to read what Gus had to say. In addition, the book explains that Van Houten’s reaction is that he has nothing to add to what Gus has written, which of course implies that his words are perfect. This is not acknowledged in the film. I believe the book version to be the better of the two. Hazel’s frantic search is testament to her love for Gus and her grief at his passing. Her desperation is felt so strongly by the reader as she searches place after place with no success. This is more pure and heart-wrenching for me personally and as a result I was disappointed that the film did not honour this. Those are the main differences that I noticed between the book and the film. Did I miss any? I have to say that I found both the book and the film nothing short of inspirational. To show love and laughter and fun times in such a pure way running parallel with the pain of cancer and the effects it has on the sufferers and those around them is so uplifting for the reader/viewer. Its a reminder that dwelling will only breed misery and this can apply to all areas of life. I definitely felt more motivated and grateful after reading and watching The Fault in Our Stars. Having said that, I do think the book is better than the film. I feel like more time was dedicated to the families of Hazel and Augustus so we could see the effects that cancer was having upon them. I also feel that some of the more poignant moments such as Gus’ decline were handled better in the book than the film. Also, the omission of characters such as Kaitlyn and Caroline was a fail by the film in my opinion. One thing that I noticed from reading the book is that nothing can be taken at face value, much like Gus and his cigarettes there are people and moments that are metaphors and some of those just didn’t seem to be utilised by the film and that’s a shame. Having said this, I really enjoyed the film and I will definitely watch it again, I just suspect I will reread the book a good few times before that happens. What is your reaction to my thoughts? Are there any that you agree/disagree with? I would love to hear! I hope you have enjoyed reading this! I will link all my other ‘book versus movie debate’ posts at the end of this post so you can check out other titles that I have compared/shared my thoughts on if you would like to read them and you haven’t already. Next Post What does it mean to be independent?